The St. Bernard Public Housing Development was already in severe disrepair and only 75 percent occupied on August 29, 2005, when Hurricane Katrina hit leaving much of the Bayou District neighborhood submerged in eight feet of water. One of four large public housing complexes in New Orleans, the St. Bernard was notorious for its blighted properties, rampant violence, drug activity, and severe poverty. Schools in the area were among the worst in New Orleans, a state whose schools regularly rank as low as 48th in the nation. Katrina rendered the housing complex uninhabitable, and many of the residents scattered as part of the Katrina diaspora. With this approach, we realized we could make a real difference in one neighborhood, and that that would then have an impact around it, on the rest of the city, and maybe even beyond. In the aftermath of the hurricane Atlanta businessman Charlie Yates, who had been involved with the revitalization of Atlanta’s East Lake neighborhood, reached out to three New Orleans friends with a suggestion. If they wanted to make a real difference as their city started to rebuild, Yates said, they should take a look at the Villages of East Lake, where mixed income housing, new schools, and a sustaining economic anchor (in that case a golf course) had completely transformed a once-struggling neighborhood. The three New Orleans civic leaders, Gerry Barousse Jr., president of Monarch Real Estate Advisers, Mike Rodrigue, president and CEO of RODCO Insurance, and venture capitalist Gary Solomon, took Yates up on the offer to tour East Lake and flew to Atlanta. During their plane trip home, they decided to bring the East Lake concept to New Orleans. “We’d each been investing philanthropically in the city, but always a little bit here, a little bit there,” says Barousse. “With the approach Charlie showed us, we realized we could make a real difference in one neighborhood, and that that would then have an impact around it, on the rest of the city, and maybe even beyond.” Columbia Parc was conceived with the goal of transforming the former St. Bernard Housing Development, and the men founded the Bayou District Foundation (BDF) to undertake the project. At the time, the Housing Authority of New Orleans (HANO) was under federal receivership for mismanagement and was being run by the U.S. Department of Housing and Urban Development (HUD). HANO/HUD released an open-source request for quote (RFQ) in 2007 seeking development partners for the former St. Bernard Projects. BDF brought on mixed-income housing developer Columbia Residential, and together they flew 40 St. Bernard residents and community leaders to East Lake to see what was possible. Dispersed former residents of St. Bernard were also tracked down and invited to return to New Orleans to weigh in on the planning. The foundation organized additional trips to Atlanta for HANO and for former residents, to help make the case. The project came about during the post-Katrina rebuilding period, and like much of the rebuilding during that time, faced some criticism and questions about motives. BDF held more than 40 focus groups with residents, local ministers, and community leaders, asking, “What do you want this to look like?” They reached out as well to the local city council member and to the mayor’s liaison. In addition, the developers sought changes to local zoning in order to be able to include a clinic, grocery store, and other retail services. Neighbors expressed concerns about what sort of retail would be built and initially opposed the changes. BDF held community meetings to explain what it had in mind. Eventually, this process of engagement began to win people over, gain support for the re-zoning, and win approvals for the project. 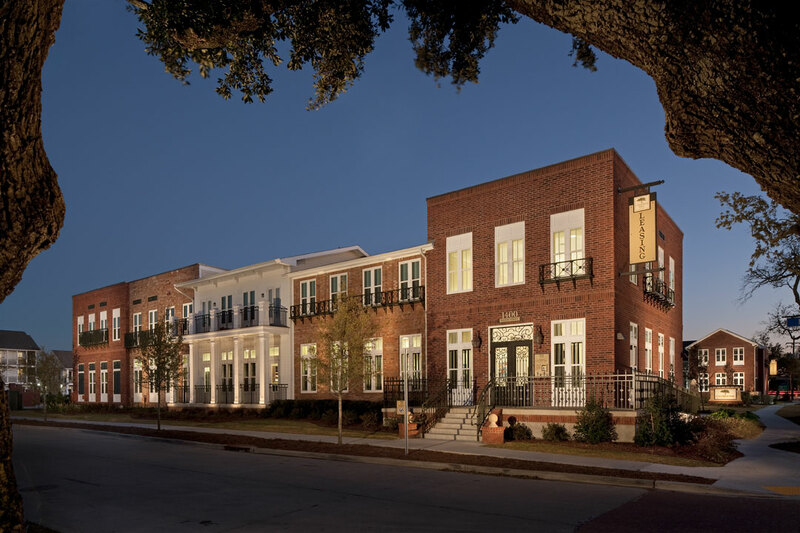 Since inception, the project has gone on to win more than 30 design awards, for design that weaves together elements of traditional New Orleans architectural styles into a carefully conceived neighborhood plan. The project has been awarded LEED silver and platinum certifications for its energy efficiency and other green features, and has garnered recognition from national figures like Warren Buffet. President Obama has visited, as have representatives from other cities and foreign nations. The President’s visit, in particular, served as a sort of ‘validating moment,’ helping to allay concerns, says J.T. Hannan, BDF’s Director of Public and Governmental Affairs. An array of public safety measures have been used to reduce crime, including criminal background checks for all prospective residents; design features to increase “eyes on the street” such as street-facing windows, front stoops, and front door peepholes; gated interior parking; and reduced rent for first responders such as firefighters and police officers. The $380 million project features mixed-income housing as the centerpiece, including 685 mixed-income apartments (among them, 120 senior-housing units) and plans for scattered affordable housing in the surrounding neighborhood that will be available for purchase. The rental housing mix includes one-third subsidized low-income housing, one-third tax credit affordable/workforce housing, and one-third market rate units. Recreational amenities include a fitness center and outdoor pool, playgrounds, a football field, and a gym. The education pipeline includes an early childhood education center (Educare New Orleans) offering high-quality early care, with an on-site K-8 charter school to come and links to a public high school that is undergoing renovation also in the works. There is a temporary health clinic and plans for a permanent facility by 2016, and there will be on-site shops and a grocery store. Anticipated income from renovating and managing a nearby public golf course will help subsidize education and services. Columbia Parc will offer the things people need to build positive, healthy, stable lives in a positive, healthy, stable community. The foundation is not a social service provider, not a builder, not a golf course designer–we’re a convener of all of these experts. BDF saw in the project’s location and configuration some of the same assets and opportunities that Purpose Built Communities believes are important to success, including enough acreage for a financially viable mix of housing types and for the education sites; a nearby asset that could become an income-generator for education and community support services (the golf course at City Park); and access to public transit as well as the ability to reconfigure the neighborhood’s streets to tie it into the fabric of the city. 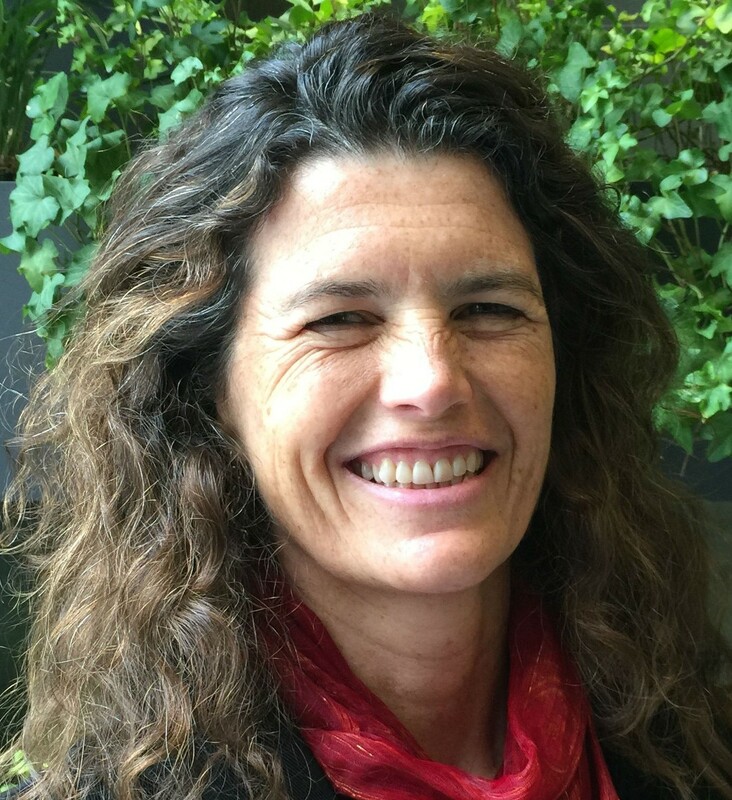 Community services provider Kingsley House has played several important roles, including conducting the initial outreach to locate former residents during the planning phase. When Columbia Parc opened, Kingsley helped the former public housing residents set up bank accounts and cope with issues like utility bills, as well as connecting residents to job training and jobs. As low-income residents have gotten on their feet and some of those services have become less needed, Kingsley’s role has evolved to focus more on community building, through hosting social events such as movie nights and gospel hours. BDF sees education as absolutely key to transforming opportunities for low-income children and families and has therefore made it a centerpiece of Columbia Parc. BDF’s survey of early childhood education organizations identified Educare as top in the field, so the team sought to bring the organization on board to establish Columbia Parc’s early childhood education center. Fore!Kids Foundation, Greater New Orleans Foundation, and the Baton Rouge Area Foundation provided funding for planning. This start-up money allowed the team to develop the master plan for the community, commission architectural drawings, pay for legal services and development activities, and allowed BDF to establish itself as a nonprofit. BDF and Columbia Residential worked in close coordination from 2007 to 2010 to secure the financing and close the deal for building the mixed-income apartments. 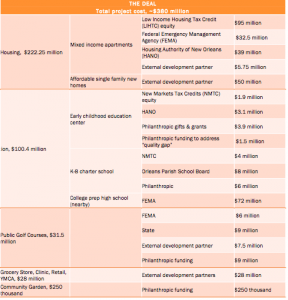 A critical piece was securing Low Income Housing Tax Credits (LIHTC), which were made available as part of the federal response to Hurricane Katrina. AEGON USA Realty Advisors purchased the credits and remained committed to the development throughout the financial meltdown of 2008. Also vital was leveraging the funds with federal and state recovery dollars to strengthen the community’s infrastructure. The Greater New Orleans Foundation’s neighborhood revitalization fund serves as a revolving line of credit, which among other things is now enabling BDF to purchase decrepit houses in the surrounding neighborhood and renovate them, to sell as affordable homeownership opportunities. The hope is to reduce blight by gradually extending the revitalization into the areas around the Columbia Parc complex. A core component of the Purpose Built Communities model is creating an income stream that provides economic sustainability for the project, a challenge for many nonprofit developments which typically include services, programming, and coordination but lack assets. Like East Lake, which relies on a historic golf course nearby for income, Bayou District Foundation also looked to golf. City Park golf courses were destroyed during Katrina, and although the Federal Emergency Management Agency (FEMA) provided $6 million for restoration, the funds did not cover full renovation, such as drainage to manage future flash floods and storms. In exchange for providing that capital, BDF received a 35-year management contract that gives it a percentage of the income from the golf course. They brought in renowned golf course designer Rees Jones, and the vision for the course is to make it and City Park a new destination for some of the more than 9.5 million annual visitors to the city. Much of the anticipated funding stream from the golf course will address what Hannan calls the “quality gap” at the early-childhood education center. Hannan, who has a background in education policy explains, “The difference between what Head Start covers and what we believe is actually needed to provide the right start for low-income children is about $5000 per child, per year.” Until the golf course renovation is complete, that difference is made up by philanthropic funding. Columbia Parc emerged out of a city in disarray. Hurricane Katrina left an already distressed neighborhood uninhabitable and its residents scattered. In the aftermath of the storm, federal, state, and philanthropic funding dedicated to rebuilding within the city became available. Many people committed themselves to the rebuilding; at the same time, controversy surrounded approaches and efforts to do so. Bringing on board those whose support was essential took many meetings as well as “show me” trips to Atlanta’s East Lake community and to other examples of mixed-income housing. East Lake Foundation and Purpose Built Communities offered not only inspiration but substantial intellectual capital to guide and advise the effort. Recognition by a small group of civic leaders that it was worth trying something new to address the persistent poverty and violence plaguing certain New Orleans neighborhoods. The housing authority coming around to the concept of mixed-income housing, and submission of a winning proposal during HUD’s RFQ process. Successfully making the case that the development would meet a critical need for workforce housing, which in turn would make the project financially viable. Finding and engaging as many as possible of the dispersed former St. Bernard residents. Securing zoning changes to include a clinic, grocery store, and other retail services. Recognized excellence in design that helped convince opponents of the value of the project. Completing a Choice Neighborhood grant application in 2010. Although BDF fell short of qualifying for a grant, the significant research and planning required by the process then helped define and build the Foundation’s “cradle to college” education model. 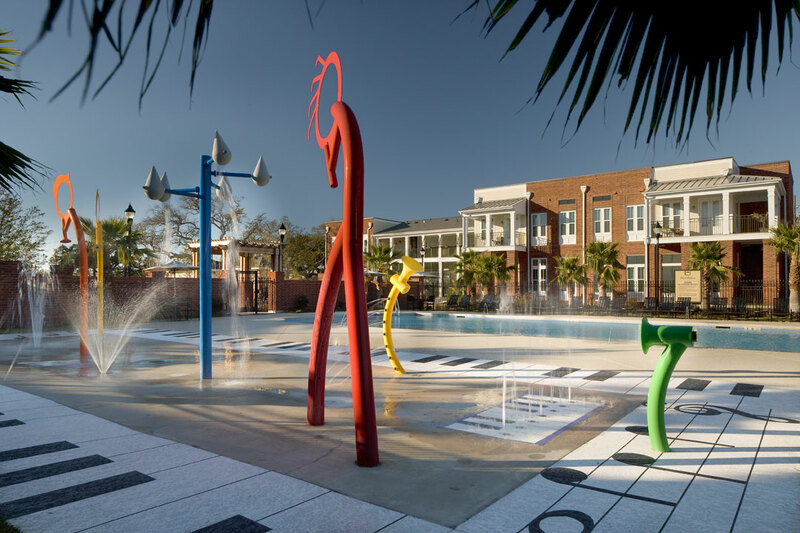 Construction of Columbia Parc created 700 temporary jobs, and 100 permanent jobs, including at the Educare early childhood center and at Columbia Parc and the Bayou District Foundation themselves. Additional jobs are anticipated in connection with renovating and managing the City Park golf course and at the planned grocery store. Crime in the neighborhood has dropped dramatically, from several hundred felonies and over 40 homicides in the five years prior to Katrina, to just two attempted felonies and no homicides in the first three years of the project. Although indicators such as jobs and reduced crime are crucial, the outcomes that the Bayou District Foundation is most eager to see are educational. Building on Educare’s established evaluation process for assessing learning outcomes, BDF plans to track students through the early childhood years, into the Columbia Parc K-8 charter school once it is completed, through high school, and, it hopes, into college. Huffington Post’s Piece on Columbia Parc. Marketplace’s piece on Columbia Parc.